The Joys and Challenges of Reinvention | WWAM Bam! All of my fresh starts are associated with a change in location. I changed towns and schools when I went into the fourth grade; we moved from Michigan to Pennsylvania the summer before my sophomore year of high school. Then it was off to college in a town in the same state but six hours away. Adult life has had me moving from Pennsylvania to Idaho, from Idaho to Colorado. And more recently, my life’s trajectory has taken me to yet farther foreign lands, first to Mongolia, and now to Turkey, where I currently live. The summer that we moved when I was 15 I experienced it as an opportunity to reinvent myself and I can’t tell you exactly why. While my younger brother and sister cried at the relocation news, I was elated! The prospect of arriving to a place where no one would know me felt exhilarating. I could create or choose the Heather these new people would be meeting. I will confess I was, and still am, a dedicated fan of Madonna. She is notorious for reinventing herself, and perhaps she inspired me in some small way. In all honesty though, as the famous saying goes, “wherever you go, there you are.” I’ve never been one to hide my life, or my self. But I do find beauty in the process of unraveling or revealing oneself to new people — which stories from a past should one offer up, and when? How does one see or identify him/herself? By your work or profession? By your family? Or is it by your passions and interests? Sometimes these conversations are rooted in culture as I’ve talked about previously here on WWAM Bam. In Turkey initial conversations seem to revolve around where a person comes from, then what a person does, and whether they are married or single. And as it goes when one lives outside of their home nation, there is usually a question or two in which one is asked what they think of their adopted country, its people, and of course, the food! With the seven major moves of my life, I can say that I have enjoyed being “the new person.” I love the getting-to-know-one-another stage of being in a new location–whether in a new work place, or a new city or country. Meeting new people and learning about the place are exciting, and it gives a person opportunities to not only learn about others, but also about themselves. I never thought about or realized that Americans identify first and foremost with their work until I lived in a place where that was not the case (Mongolia). The challenge or struggle in fresh starts is that it can take a good bit of time to build and cultivate friendships. One’s workplace offers up immediate colleagues and acquaintances, but it takes time and energy to shift those initial connections into a relationship of depth. In my forties now, there is much history to inform a new person about, as well as current interests and endeavors, and finally perhaps your wishes, hopes, or dreams for the future. So many stories to share to create the necessary foundation in order to have a lasting and true friendship. While I was an extrovert in my youth, I have, over the years, shifted from that side of the scale to being a person that teeters on the line. Now as an ambivert I need a balance of social gatherings and “me time” (time spent alone). And the large anonymous gatherings that were enjoyable in my 20s and even 30s (gathering at bars, pubs, etc) don’t interest me much. I prefer the company of one, or a few, so that conversation can transition from surface/small talk into philosophical or more meaningful spaces. Therefore I seek and cultivate these interactions. It takes time and effort, and I rarely pursue connections unless there is first that thing we refer to in popular culture as a “click.” It doesn’t only apply to romantic connections, but friendships as well. As an expat abroad, the new friends I make along this journey are the family I am choosing. I’ll sign off here with a final comment that it is important to have a network of support as you endeavor into a “fresh start.” Thankfully, with the gifts of technology–the burdens are an entirely different topic–you can stay and be in touch with anyone at almost any given moment. I rang in the New Year this year with my sister in Boise, Idaho. 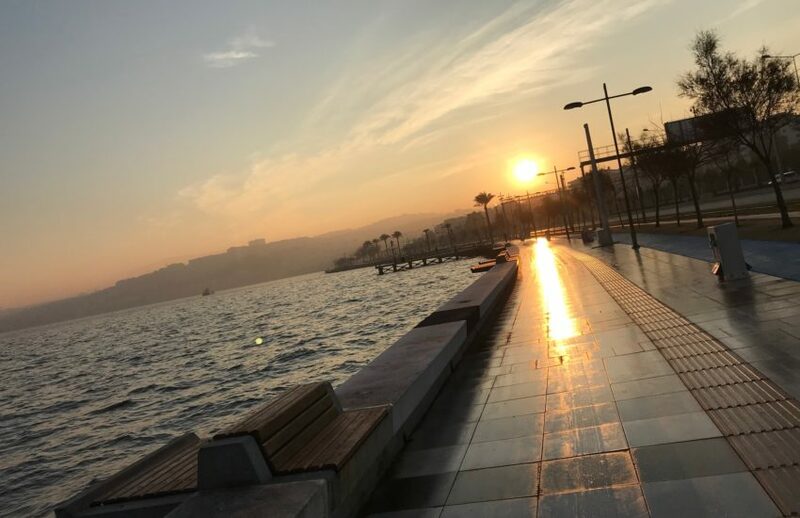 I was sitting on the seaside here in Izmir, Turkey, and was WhatsApp-ing with her at the moment my new year began. Ten hours later, I rang in her entrance to 2019. What a gift technology is! And later that day, New Year’s Day, I had a new friend over for a bottle of wine and a home-cooked meal. Yes, these are the joys of human connection–that thing which we crave more than anything else, I think…..
We’d love to hear your thoughts about the joys and challenges of a fresh start. We all have them at some point or another. Or many. We are wishing all of our readers a fabulous new year filled with health, joy, and prosperity! Şerefe!